Alfred Hitchcock’s “Psycho” is the second movie on the list that was inspired by real cannibal Ed Gein. Norman Bates is actually based loosely on Gein. Of course Norman only wore women’s clothing. Gein wore women’s skin. Norman Bates is a real mamma’s boy. So much so that he’s still under her control even though she’s been dead for years. Her control leads him to murder. The first victim in the movie dies in one of the most famous movie scenes in history. Marion Crane (Janet Leigh) made the mistake of stopping by the Bates Motel. Her second mistake was taking a shower. Norman, dressed like mother, stabs her to death in the shower. It’s the scene we all know. “Psycho” isn’t necessarily jumpy scary to modern audiences (but you can bet it was in 1960). What makes it a great movie is Anthony Perkins‘ performance of Bates and Hitchcock’s directing job. Perkins is perfect. He’s this odd mixture of handsome, innocent and crazy. It’s hard to imagine that such a soft-spoken man can really be a monster. Hitchcock was meticulous with every scene. From character closeups to camera angles, the work is pure genius. Did You Know? “Psycho” was the first American film ever to show a toilet flushing on screen. 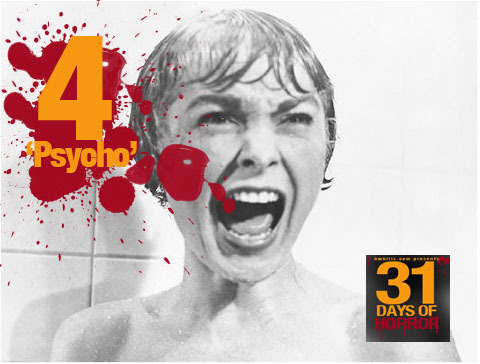 See the rest of the 31 Great Horror Movies.